These instructions are intended for the intermediate or advanced weaver. These instructions can also be used as a refresher course for those of you who are somewhat familiar with the weave but still need a bit of assistance. 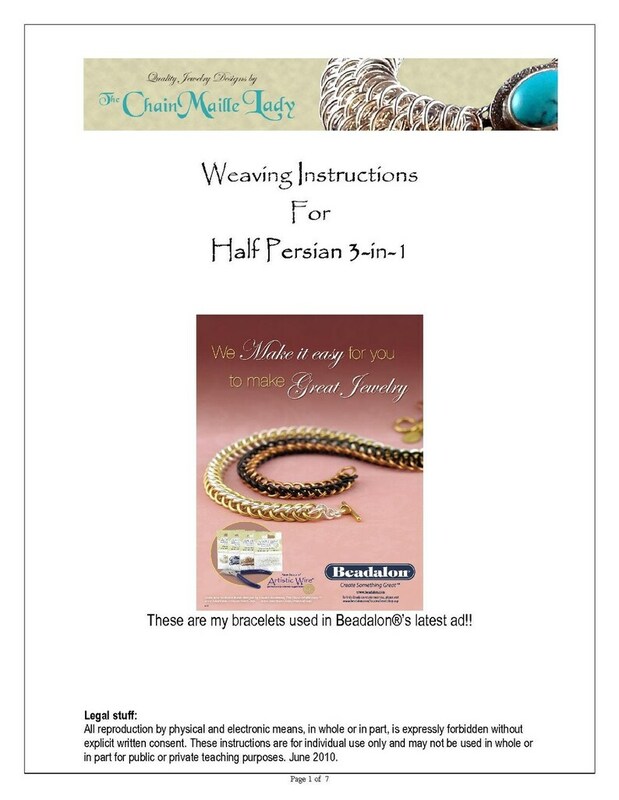 This listing is for the PDF Instructions on how to weave the Half Persian Chainmaille bracelet. You will get a PDF file containing full color step by step instructions. You can access the file any time on your Purchases page, provided the transaction hasn't been canceled or removed. There is generally no time or download limit with Etsy. Excellent rings, great service, and fast shipping. Thank you! Excellent tutorial to refresh my rather dusty memory! Thank you so much! Thank you so much for sharing instructions for your designs! I can't wait to try this! I accept Paypal, checks, and money orders. Please make checks and/or money orders payable to: LAUREN ANDERSEN. Once your check and/or mony order clears, I will ship your item/s. The sales tax for California is included in the price already, you will NOT be charged any additional money for sales tax. I want you to love your purchase as much as I loved making it. If you are not completely satified please return item to me within 7 days of receipt. You are responsible for return shipment and insurance if applicable. Upon receipt of item by me a full refund will be issued. Custom orders are always welcome! I would love to design a specific item just for you. All bracelets can be resized up to 9". For bracelets larger than 9" a small additional fee will be required. If you require a specific necklace size up to 22" just let me know. I look forward to working with you!